Matt Kaufman rips Mr. Snuffles apart to check on the status of the egg. Cuteness triumphed in the annual Egg Drop, with the top prize going to an egg capsule made out of a stuffed animal dubbed “Mr. Snuffles” by team members Matt Kaufman, Eugen Sokolov and Dustin Atles. 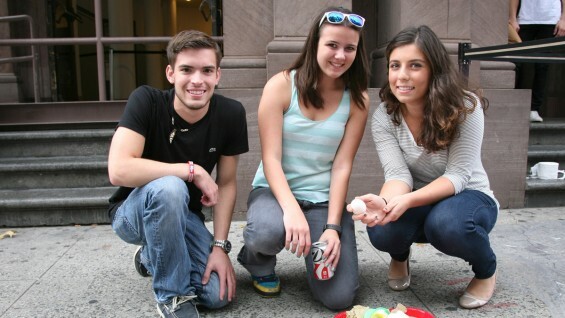 Sponsored by the Engineering Student Council, the Egg Drop attracted eight teams made up mostly of freshmen engineering students. Constructed beforehand or on the spot each device had to carry a chicken egg approximately 30 feet straight down without violating the integrity of the ovum. A spreadsheet calculated the winner based on a formula that includes the weight of the device, the distance from the center of the target and, of course, the status of the precious cargo. The score gets multiplied by zero if the egg is broken. Second place went to Alexa Orrico and Amy Chambers, both freshmen engineering students and the only all-women team. Their device, constructed primarily of disposable plastic plates and a drinking cup, gracefully lowered its precious cargo by creating wind resistance during the fall and performing a final flip to land upside down--its fragile payload in tact.